People use food coloring to dye Easter Eggs, and I use food coloring to dye yarn, so why not use Easter egg dyeing kits to dye yarn, too? These pellets come with food coloring and citric acid, so theoretically you shouldn't need to add any additional acid to your dyeing process. 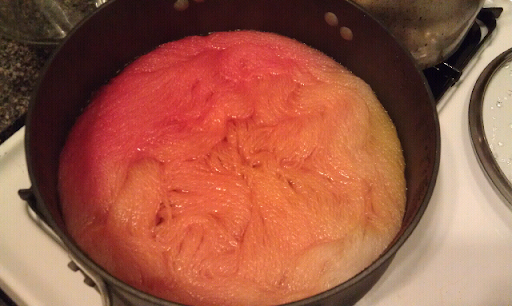 As you will find from watching the video later in this post, adding vinegar early in the process will help the dye absorb to the yarn faster, making beautiful space dyed colors. Isn't it amazing how much difference a little acid can make? 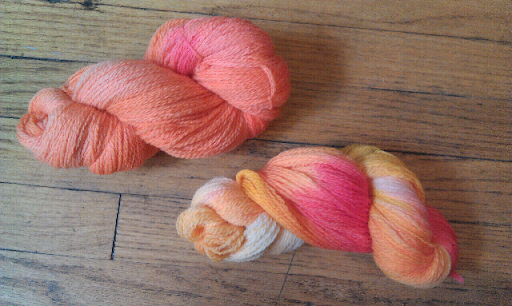 The two skeins below were dyed with identical materials, but in the bottom/right one vinegar was added earlier in the dyeing process. 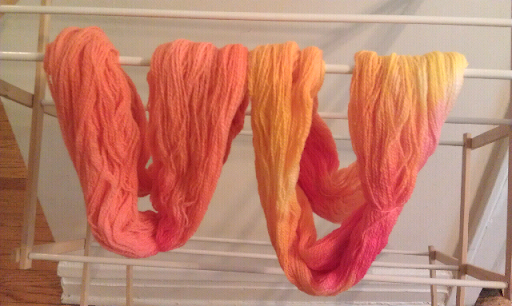 After my initial experiments dyeing yarn with Easter egg dye tablets I have come to love these little pellets of color. I plan to make many other space dyed colors in the future following this technique. I cannot believe I will have to wait until next Spring to get even more pellets!